Growing edible flowers is way fun in the vegetable garden. Nothing makes a meal more beautiful than the vibrant color of edible flowers. Invite friends over for dinner and use flowers to brighten the salad, sweeten the desserts, or garnish iced drinks. And for something truly magical to conclude the meal, top dessert with a candied rose or pansy. Flowers can transform an ordinary plate of food into a work of art. They often have unique, spicy, or subtle flavors that (like fresh herbs) bring wonderful variety to the table. Growing edible flowers should be part of every vegetable gardener's plan. And before the flowers even make it to the table, they help us in many ways in the garden itself. Growing edible flowers provides food and shelter to beneficial insects (the ones that eat plant pests), distracts and confuses insect pests, and brings beauty to the vegetable garden and joy to the heart. 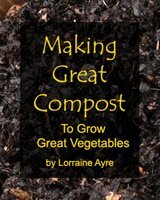 Every vegetable garden should include a variety of edible flowers in among the vegetables. Throughout the garden I have calendula and dwarf marigolds here and there, and in one corner is a large patch of borage, whose blue stars I just adore. Tito grows nasturtiums, and when they start to take over the flowerbed in late summer, I chop them back (when he's not looking) and add a bit to salads. And I grow different varieties of basil (which have edible flowers) among my tomatoes. I'm also growing edible flowers in several large pots - pansies, violas and corsican violets -scattered around the yard, which I have to nurse through the heat of summer by deadheading, pinching back, and moving their pots into dappled shade. Before you start eating flowers, you need to be aware of a couple of things. Only eat organically-grown local flowers, because the pesticides used on flowers are much nastier than those "okayed" for food crops. And never ever eat flowers from the nursery or supermarket, which are often imported from places where DDT and other US-banned pesticides are still legal, and which are also treated with preservatives to extend their shelf life. Calendula (Calendula officinalis) Looks kind of like a cross between a marigold and a daisy, and tastes a bit tangy and spicy. It is known in some circles as poor man's saffron, because you can use it to flavor rice and color it yellow. It is used in skin balms for its soothing effects, and has some anti-viral and anti-inflammatory properties. Having said that, it also causes allergic reactions in a few people. And don't eat it if you're pregnant. (Probably true of most flowers). 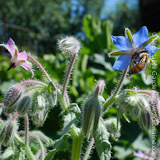 Borage (Borago officinalis) "Borage for courage" I used to hear when I hung out in herbalist circles. I love the bright dark blue stars, and use them in another passion: making flower sculptures in my "other" life at Divine Nature Cards. I also like to put a few on salads for color. Nasturtium (Tropaeolum majus) Both leaves and flowers are edible, and both are spicy. I pull off the petals and cut off the light part at the base of the flower, and add baby leaves to salads. Marigold The strong smell of growing marigolds seems to help confuse plant pests in the garden. You either like the taste of them, or don't. I use the petals for color in salads, my favorite being the solid, milky orange variety found in the Disco Mix dwarf marigold blend. Violets and Pansies (Viola sp. and Viola X wittrocki) I'm a purple freak, and I'm so desperate for color come spring that I seem to always plant way more violas and pansies than I have time to care for through the summer. (They need extra care when it gets hot.) I use Johnny-Jump-Ups for color in salads, as well as other colors of violas. And you can make candied violets using the recipe for candied roses. Daylilies (Hemerocallis sp.) All daylily blossoms are edible. But make sure you know the difference between daylilies and other kinds of lilies, like Easter lilies and Stargazers, which are poisonous. Daylilies have such large beautiful blooms and come in such a range of colors, they are absolutely stunning as the centerpiece of a cake, cheesecake, or even large salad for presentation to guests. The white part at the base is bitter, so cut it off before serving. They are somewhat sweet and... how do I put this, they are uplifting to eat, almost a heavenly experience! 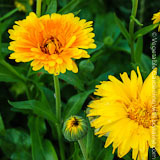 Marigold (Tagetes sp.) This is one of my favorites to grow, but not necessarily to eat. I use the petals for their glorious color in salads, but I don't just pop a whole flower in my mouth like I would borage or d... oh, wait, I have to save the best for last! Garlic (Allium sativum) Garlic flowers, and the curly bud tops before they bloom, have become a hot thing it haute cuisine, and are all the rage in the restaurants and CSAs around here. They do taste like garlic, and are fun to eat. You can cook the tops with buds in stir-fry like you would Japanese snap peas. Chives (Allium tuberosum) Taste like chives. Kind of look like red clover blossoms (also edible), but they're purple, not pink - okay by me! Toss a couple in with salad. Scarlet Runner Bean (Phaseolus coccineus) Bright red blossoms go wonderfully in a green salad. And on the 4th of July, top a green salad with red runner bean flowers, a handful of blue borage stars, and some little white violas! Your friends will applaud. Scented Geranium (Pelargonium species) These have been hybridized for hundreds of years and now come in a variety of scents, including rose, lemon, coconut, apple, lime, peppermint, nutmeg, ginger and almond. Both leaves and flowers are edible, but they are strong tasting and are used more for infusing flavors and scents than for consuming. Garden Peas (Pisum sp. )(NOT Sweet Peas, which are poisonous) The white flowers of edible English peas (or garden peas) taste like peas and are also good in salads. Bee Balm (Monarda sp.) There are several varieties of monarda, including a spikey purple one, and a red one whose flowers look like little fireworks. The leaves taste like Earl Grey tea (hence the name "Wild Bergamot"), and the flowers taste kinda like a cross between mint and oregano. Roses (Rosa rugosa or Rosa gallica officinalis) Roses are incomparable as edible flowers. The more fragrant the rose (older varieties especially), the more flavorful they are. Roses are the queen of the garden, and the petals can be sprinkled atop cakes or scones, used to make rose tea or made into candied roses (best when only partially opened). Herbs: sage, lavender, coriander/cilantro, thyme, lemon verbena, and anise hyssop. Mostly they taste like the herb itself, and can be used as garnish on any dish containing that herb. Dandelion! (Taraxacum officinalis) Poor dandies get such a bad rap, which they don't deserve (unless you really do need a putting-green lawn). All parts are edible, the tender spring greens in salad, the whole flowers also in salad, and the roasted roots as a delicious coffee/tea substitute that is good for the liver. I've never made dandelion wine (not so good for the liver ;-) , but I hear it's good. I hope you have as much fun as I do growing and eating edible flowers. Hoping to have a place here soon where you can show off your own creations and recipes.